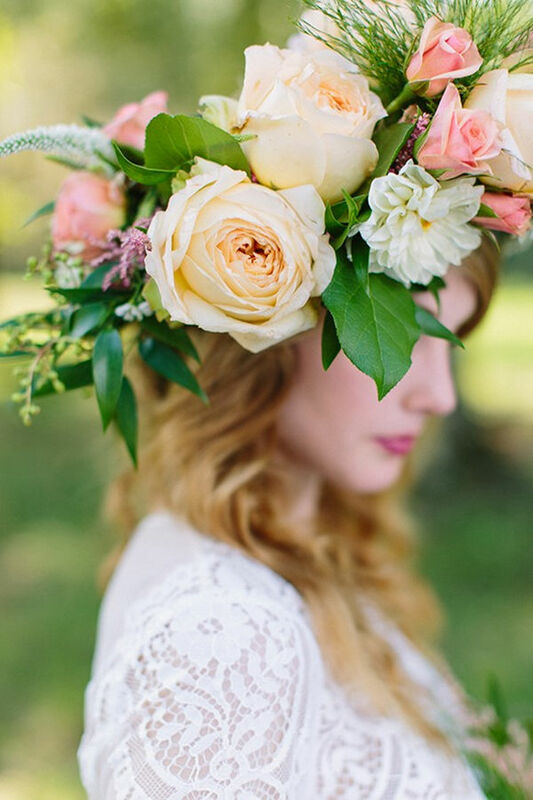 If there’s something that can always enlighten a day, and make it perfect, it’s fresh flowers – the most versatile, beautiful, all-natural, and, as a bonus, widely available wedding accessory! Can you picture yourself walking down the aisle crowned with such a stunning accessory? 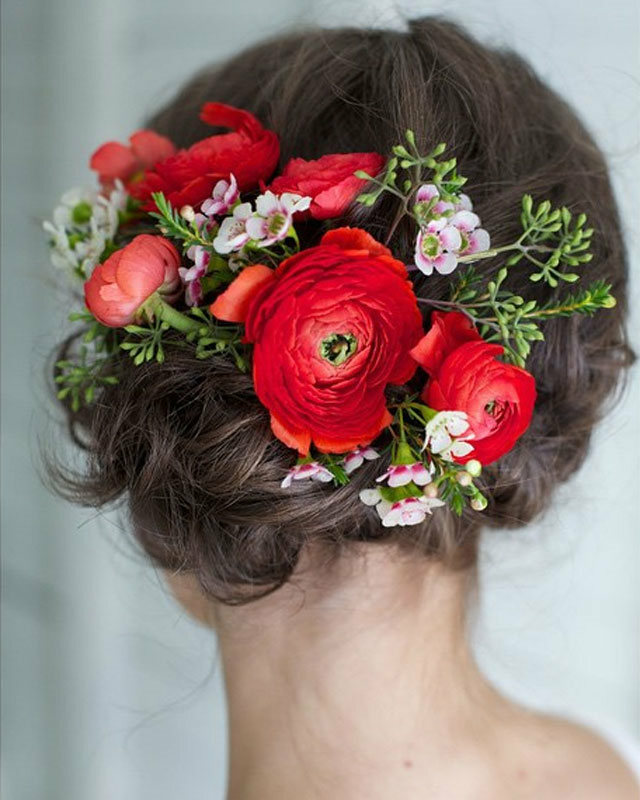 The following wedding hairstyles with flowers should inspire you. 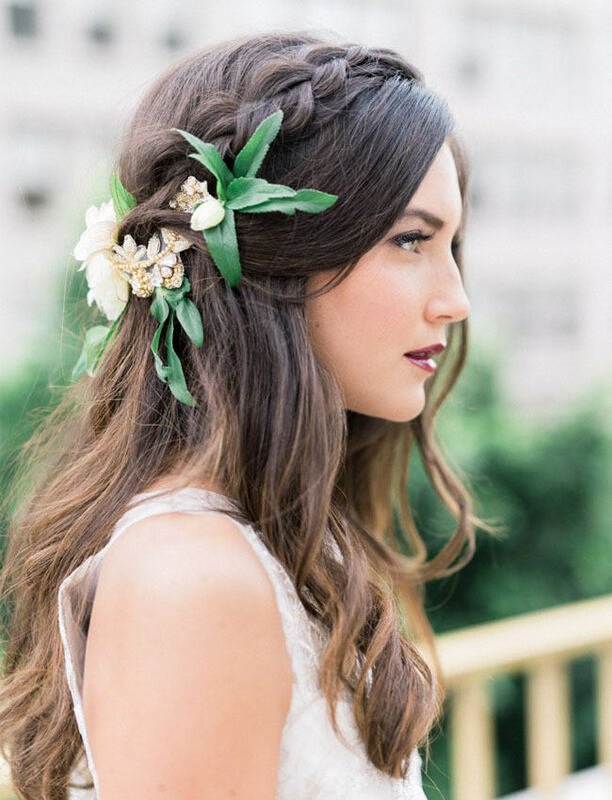 By embracing this simple, still spectacular wedding hairstyle, you’ll feel as if you’re the queen in your own fairyland. Get your hands on a handful of beautiful mini-roses and add them to your messy, curly updo, and you’ll be the striking image of bohemian beauty and simplicity. Make sure to add volume to your crown and leave some curly strands out for a more casual look. 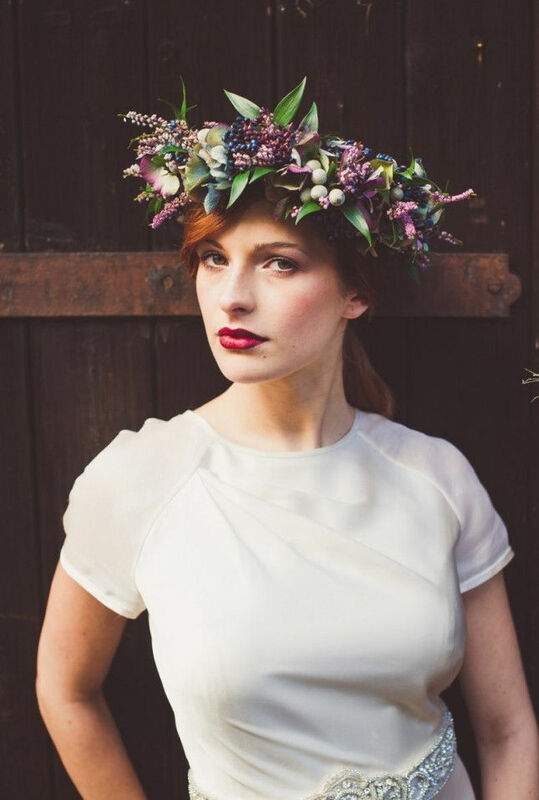 Such a ravishing flower crown as the one below is the perfect accessory for a shabby-chic, vintage-like wedding. Combine it with a low, slightly disheveled side bun for a modern, asymmetrical look that will suit any hair type or length. If you want to make a statement with the choice of hair accessory for your wedding day, opting for an extravagant, yet spectacular flower crown is the one way to accomplish that. Because the headpiece makes such a bold statement, the hairstyle can be as simple as a ponytail or a braided half-up, half-down style that secures the crown on your head. 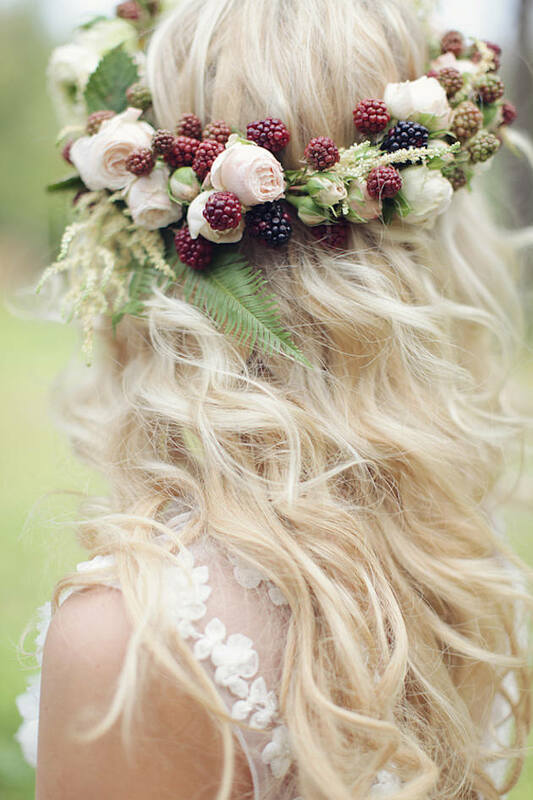 Let your beautiful locks of hair down, and add a sweet handful of little, pastel flowers. 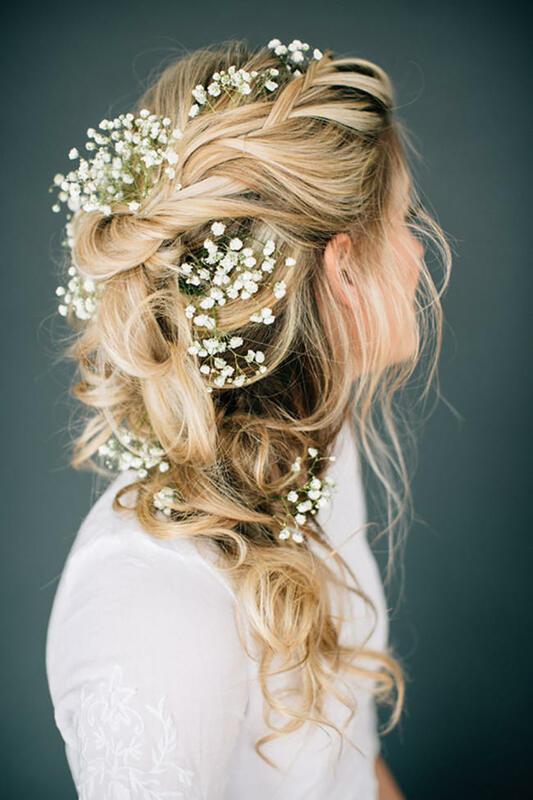 Unquestionably, this is one of the wedding hairstyles with flowers that is ideally suited for a romantic, outdoorsy ceremony, possibly in the dark woods. Flowers describe a type of beauty that is timeless, and will never go out of fashion. Such an example is the one below– a lacey, luxurious, ivory dress, with a back hairdo, accessorized with dark purple flowers. If your style is classic, luxurious, yet, unconventional, this elegant and complex updo will definitely complement you. There’s nothing more beautiful than a wedding on a beach; it enables you to embrace your childlike inclination, and unleash your carefree spirit. 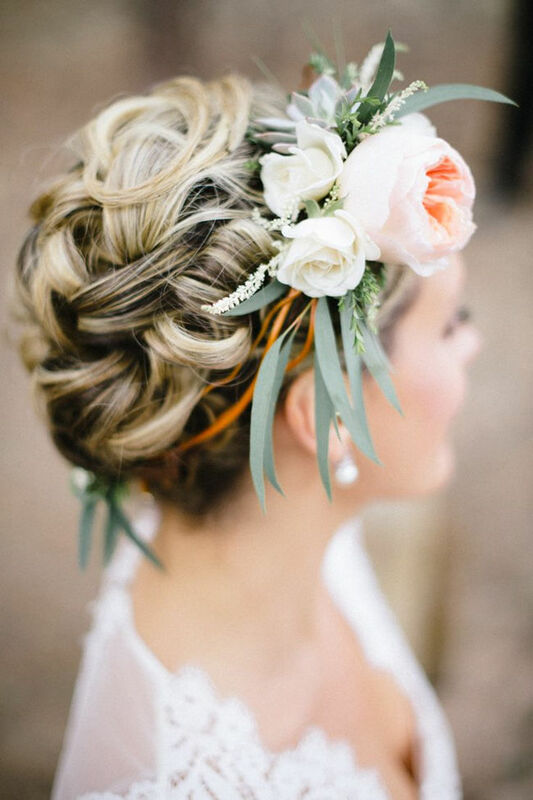 Adopting a loose, braided hairstyle embellished with a good selection of either pastel or more colorful flowers is an ideal choice for this type of wedding. 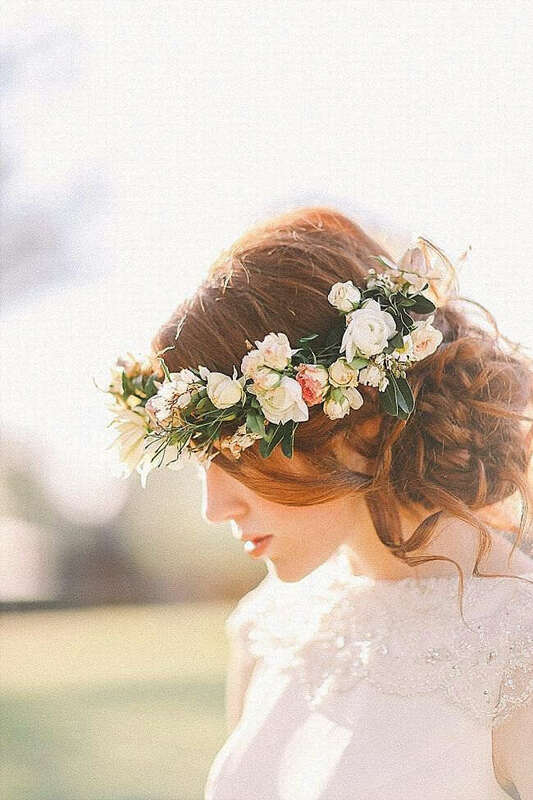 This whimsical flower crown is ideal for the bride that wishes to embrace a simple, classic look, which is unequaled in delicacy. You can either choose full waves, or you can curl just the ends of your hair to give it a cohesive look. 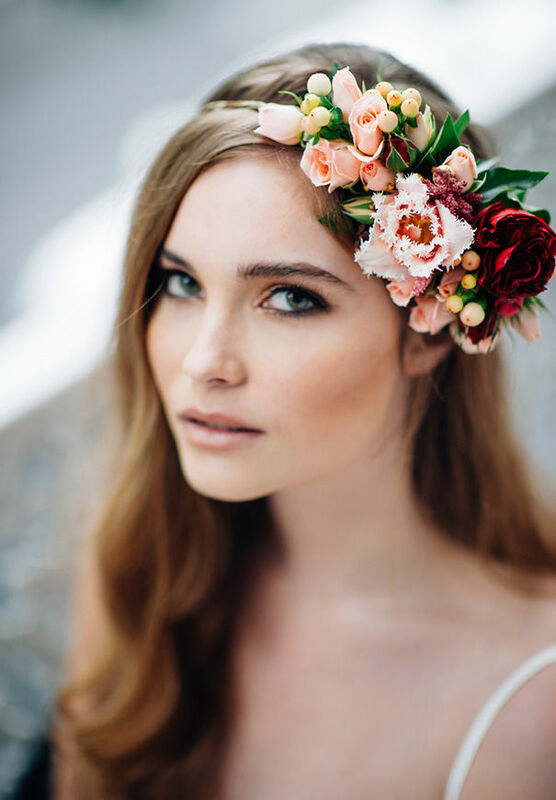 To top it off, opt for a floral headband or crown in shades of peach and crimson – it is as beautiful as it is unexpected. 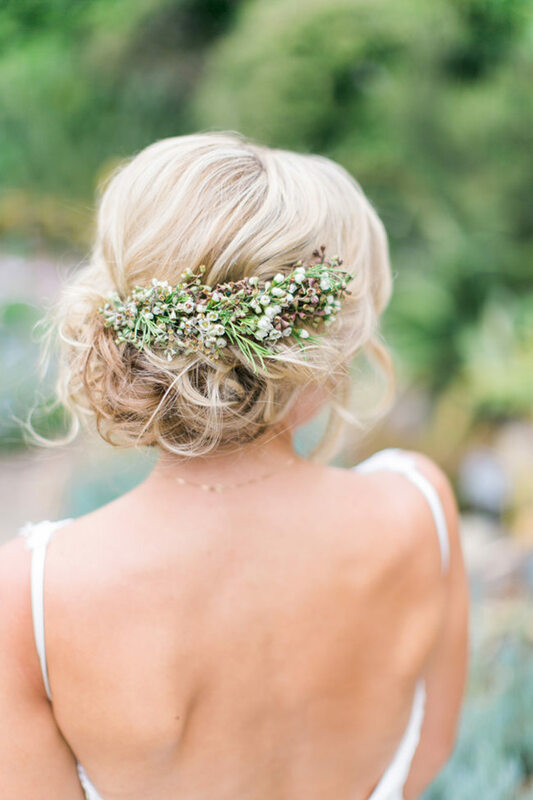 Such a dreamy collection of white, rust-colored flowers and soft green goes perfectly with a modified bun. This neat and tidy hairstyle is obtained by simply tucking the hair under the flower piece. For added texture and visual interest, you can add one or more braided pieces. All eyes are on the hairstyle with this eye-catching red and green contrast, which calls for a simple updo. 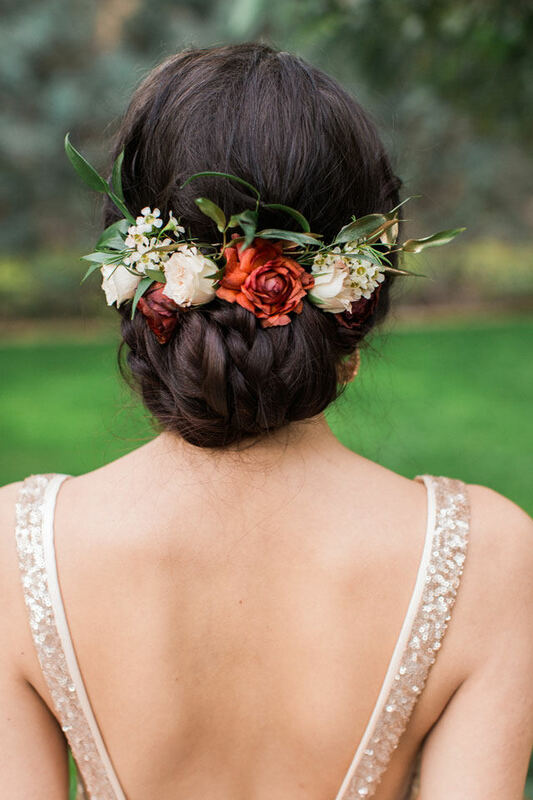 This bride combines this modern accessory with a demure, off-center messy updo that compliments the striking floral arrangement without competing with it. 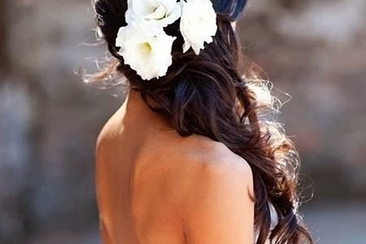 That is one of the many wedding hairstyles with flowers that are sweet in all senses of the word! The pastel mini-roses paired up with crimson berries make an unconventional mix-up – romantic and original are two features characterizing such a look. Embrace the style of a delicate princess, who has run away to marry her most beloved prince. 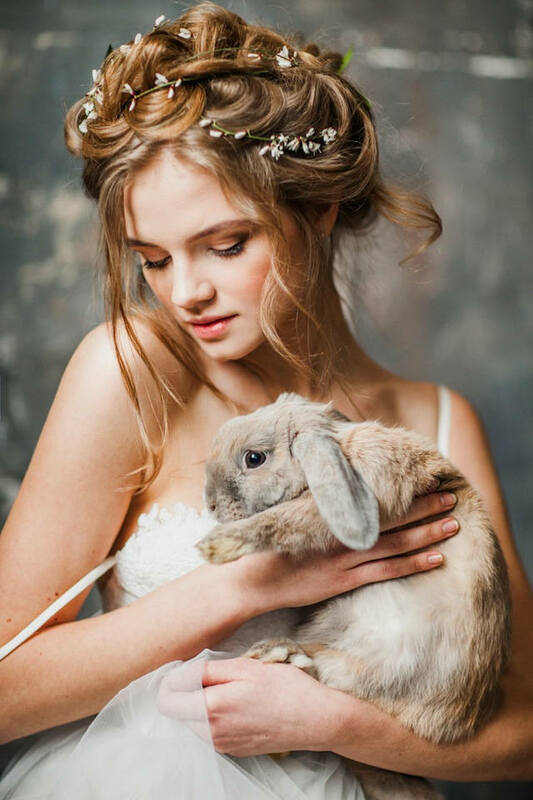 Make a loosely braided crown and intertwine dainty, delicate white flowers in it, like baby’s breath, creating a different kind of flower crown. Keep some loose, face-framing layers out of the crown and the resulting look will be as stunning as it is ethereal. 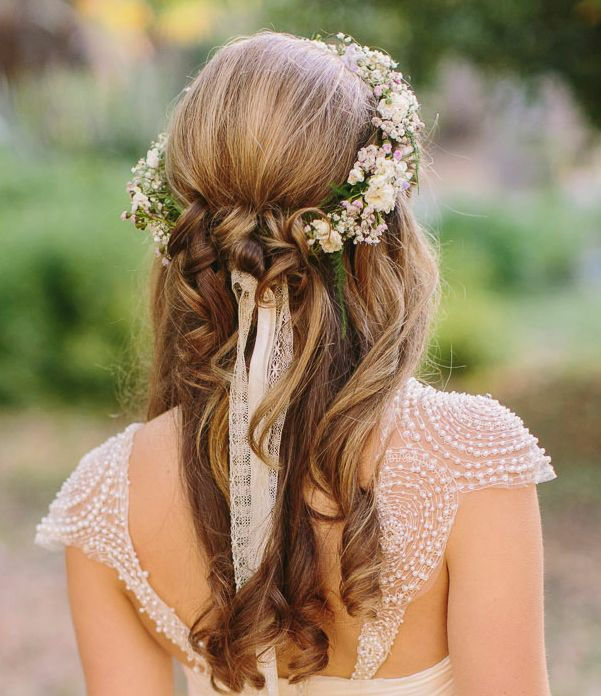 This bride embraced an effortless, yet nothing less than stunning look, by choosing a loosely braided hairdo, and combining it with an ivory, elegant hair accessory. The result is enticing. 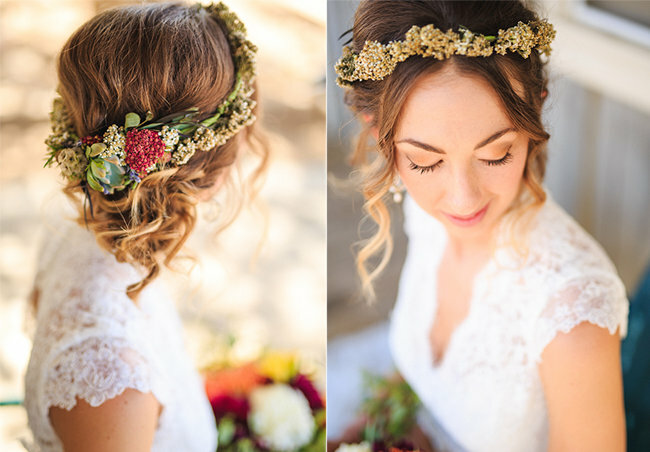 This look is ideal for a summer outdoor wedding, or a fall ceremony. 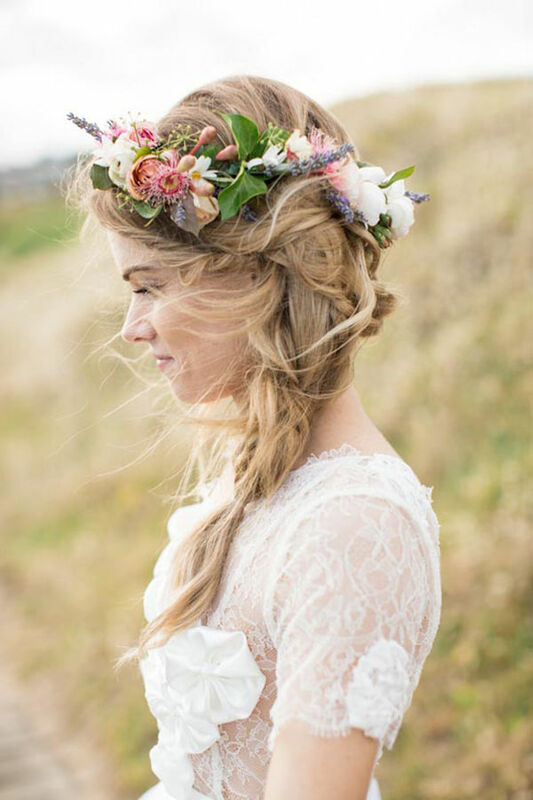 A very loose side braid can look bohemian and chic, and it is perfectly complemented by wildflowers intertwined with it. If you recognize yourself as a wanderlust enthusiast who adores traveling, this romantic look is ideal. 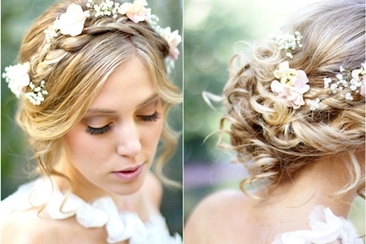 This is one of the simplest and softest wedding hairstyles with flowers and it suits any venue or dress style. What is more, it exposes an interesting design or cut-out for the back of the wedding dress. Your bohemian, wanderlust style as a bride is completed once you opt for an accessory as the one below. 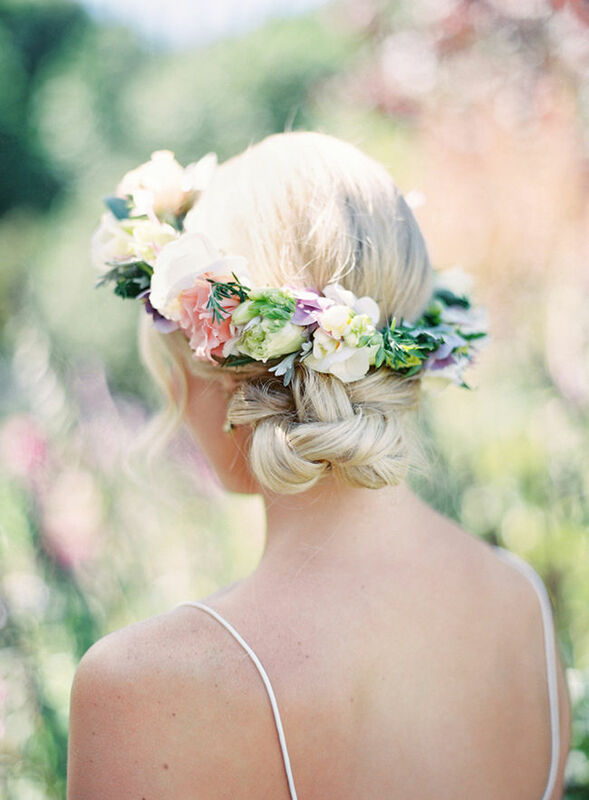 The white and pastel flower crown is a beautiful accent for this loose, undone updo. This hairstyle requires a loosely curled mane. The face-framing layers and ends sticking out of the updo give it a relaxed feel. The look of this bride is both romantic and effortless. The flowy, loose hairdo and the addition of red, yellow field flowers create the image of a fairy. The image below showcases a hairstyle which is equally subtle and beautiful. 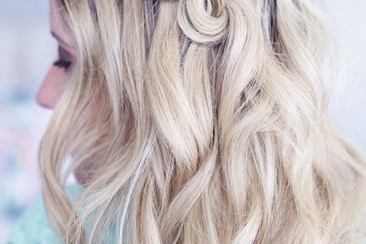 It’s as simple as creating loose waves in your hair and putting it up in a ponytail. 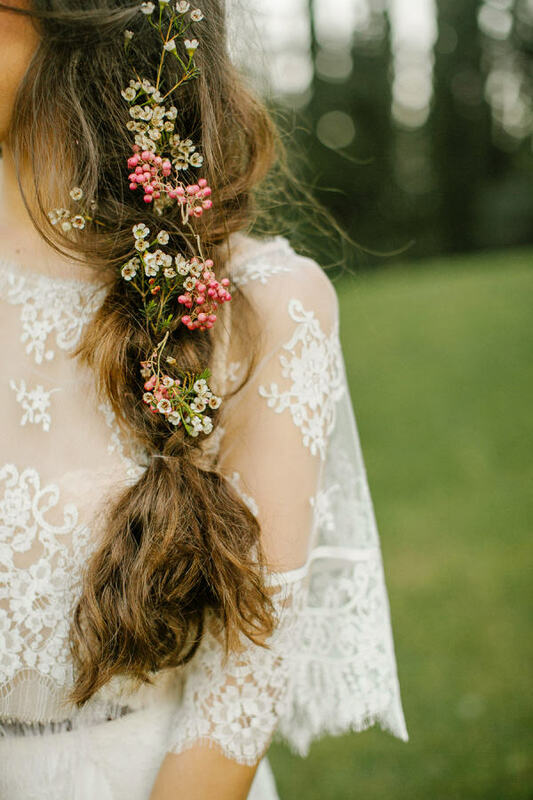 Add baby’s breath for a touch of delicate elegance and some very, very loose braids for texture. The result is breathtaking. This bride chose this combination of greenery and whites to complement her look, and the result is absolutely lovely and unique. The accompanying braided updo is easy to create, and it gives depth and dimension to the look. This stunning bridal look is a combination of pastels, with the flower crown sitting daintily above this loosely knotted side hairstyle. 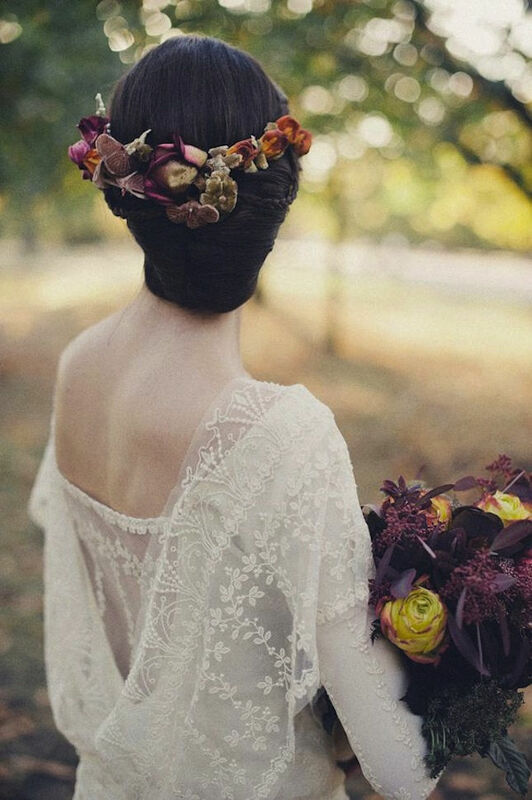 It’s one of the wedding hairstyles with flowers that is perfect for a forest wedding, as it keeps the hair up and exposes the shoulders. 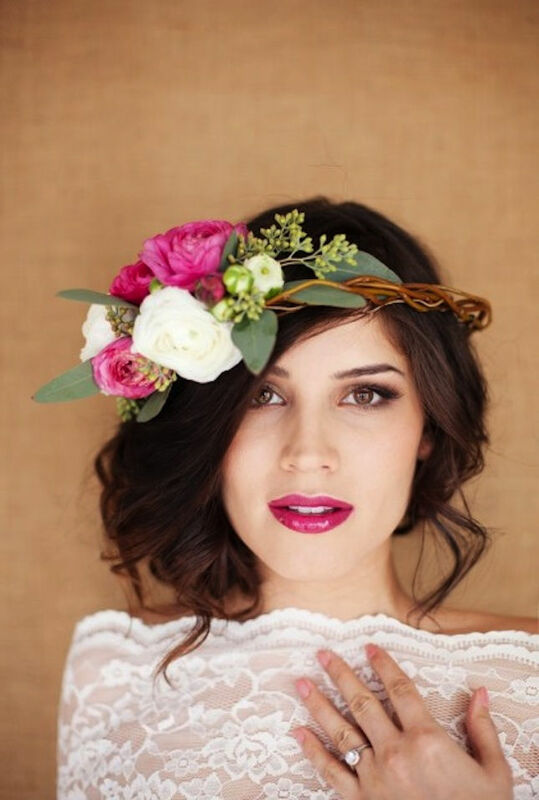 If you want to embrace a hair accessory that makes a statement, choosing a rose floral crown is certainly an option. Because the head accessory calls so much attention to itself, it is best paired with an uber simple hairstyle; wear it down and loosely curled for added movement and body, and let your crown shine.